Wilmette Village a subdivision of the W.63.55 chs. of N. sec. of Ouilmette Reservation T.42N R.13 E.
Early street map of Wilmette from Division St. (aka 8th St.) to West (aka Park) showing former street names. Adaptation of engraving by Louis Helke & Co.
Lands of H. A. Dingee yet to be added. Also the 40 feet N. of and adjoining the center of North Ave., and the 33 feet S. of an adjoining the center of South Ave. Lands of Schneider and Haines yet to be added. West Line of the Ouilmette Reservation, now 15th St. The scale of the original by Louis Helke & Co., engravers is 200'0 to the inch. 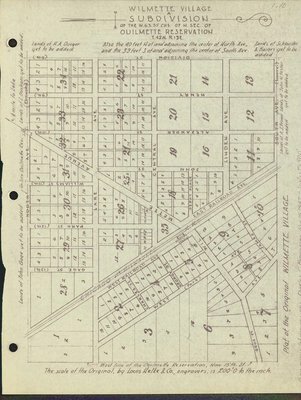 Plat of the original Wilmette Village. Coy minus lot dimensions Charles C. Henderson Nov. 16, 1947-scale 1" = 500'; Lands of John Gage yet to be added; no. line Ouilmette Res. ; 1/4 mile to Lake Lands of L. Dusham yet to be added; Lands of A. J. Brown yet to be added; Lands of John N. Foster yet to be added; Gage St. (13th); North Ave. (Elmwood); Park St. (12th); William St. (11th); Alexander St. (10th); Henry St. (9th); Lake Ave; Wilmette Avenue; Central Ave.; Depot Place; John St.; Linden Ave.; South Ave. (Laurel); East Railroad Ave.; Chicago & Milwaukee R. R.; West Railroad Ave.; Charles St.; George St.; Gross Pt. Ave.; James St.